I always had a pretty difficult time keeping my students' math notes organized. Although I taught my students HOW to take notes, there were always a few who would skip random pages or just not remember where their notes were. In return, they never EVER referred back to their notes. It just seemed like a waste. This past school year, I finally implemented interactive notes in my math class. Let me tell you - it changed EVERYTHING! I cannot say enough good things about them! Student notebooks are neat and organized. They know exactly where to write their notes and math reflections. Practice problems are always under the notes so that they can refer back to them. Students ACTUALLY look back in their notebooks (often) in order to refresh their memories. Absent students catch up easily and always ask for their missing notes. Students really love their notebooks and are proud of their work. Now, I'll be the first to admit that (like everything else), there is some trial and error that comes along with interactive notebooks. The first time that I used interactive notes for a math lesson, I gave the students way too many notes to cut and glue and...well...let's just say that I didn't have much time to teach the rest of that period. 1. Cutting and gluing can take a long time. Don’t worry – students will get faster at it! Try to find or create notes with limited cutting. Although there are some CUTE interactive journals available, some of them are not practical in a class period with limited time. 2. Give students a time limit to cut and glue their notes before you start the lesson. I encourage them to help one another if they see that their neighbor is not finished yet. I even walk around and help students during the countdown (which they love). Once the time limit is up, I start my lesson and that student needs to glue their notes at a later time. 3. Unless you plan on spending a good part of the lesson cutting and gluing, don't give students more than three pages at a time. There have been times that I have assigned cutting and gluing as morning work, and this helped a lot because we were able to start our math lesson immediately. 4. Assign students various jobs! I have two students that pass out and collect the scissors and glue bins, another passes out the interactive notebook pages, and a fourth student is the "recycle bin manager" and picks up all of the scraps of paper when he/she is finished cutting and gluing. 5. 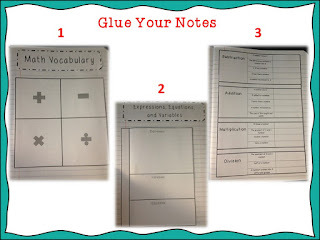 Cut and glue notes in your own notebook to show students the finished product. I often take quick pictures of my notes with my phone and then project the picture on the board for students to see more clearly. If you don't have time for this, cut and glue at the same time as the students. I am usually finished first, and they always want to compete in order to keep up with me. I then hold up my finished product as a visual. This ensures that students glue their notes correctly and it saves a LOT of time! 6. Cutting and gluing is often a quiet activity in my classroom. When they cut, glue, AND talk, they move a whole lot slower. 7. I find that liquid glue works better than gluesticks. A FEW dots about an inch away from the edges goes a long way! 8. Don't give up on your notebooks! Stick with them the entire year, and you will NOT regret it! 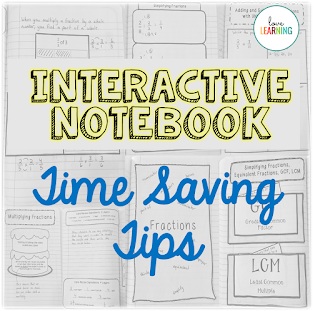 Here are two interactive notebook freebies to explore!